Queen Annes Guest House is situated in a quiet street just a minutes walk from York centre. This charming B&B offers clean, comfotable accommodation at great rates. Free parking available. Queen Annes Guest House sometimes limits bookings to 2 or more days. First floor double room at rear of guest house. Small but well appointed en suite. Freeview TV, Tea/Coffee making facilites. PLEASE NOTE OUR CHECK-IN TIMES are 11.30am - 1.30pm and 4.30pm - 7.30pm unless agreed by prior arrangement. First floor family en suite room. 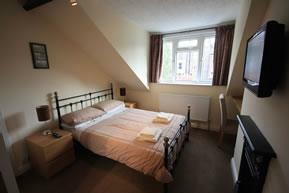 Double bed and two single beds en suite, Freeview TV, Tea/Coffee making facilities. Can be booked as double/twin or triple. Second floor triple room. En suite bathroom with dressing table, colour TV and Tea/Coffee making facilities. A very welcoming couple. Good breakfast. Brilliant location for a couple of days exploring York.